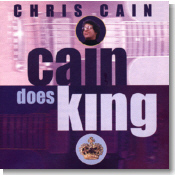 Chris Cain's publicity package used to claim that he looked like Frank Zappa and sounded like B.B. King. Over the years his physical resemblance to Zappa has diminished, but he still sounds like B.B., especially on the new album Cain Does King, this month's Pick Hit. Funk is in the house ... funky blues and soul, that is, with the new CD, The Houseman Cometh, from Galactic lead singer Theryl "Houseman" de'Clouet. It's our July Surprise feature. Our newest Blues Bytes reviewer reminisces about one of his favorite independent albums from 1996, 3D Blues, from Michigan's bugs Beddow Band in this month's Flashback selection. This month's What's New section features new releases from Mighty Sam McClain, John Mayall, Kenny Neal, Aaron Neville, Mem Shannon, Studebaker John and the Hawks, Michael Hill's Blues Mob, Sean Costello, and more. Aerosmith fans beware ... our chief reviewer pans the Aerosmith tribute CD, Sweet Emotion.